On Thursday night the four groups presented their results and prototypes that they had been respectively working on during the workshops. 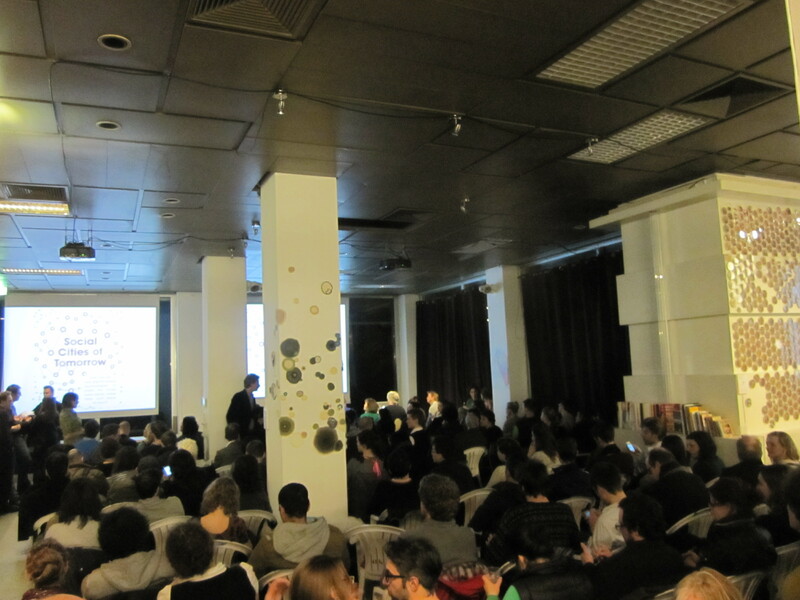 The event, which took place at Mediamatic, was completely sold out. “When you do an image search for the query smart city”– Martijn from the Mobile City began explaining to the audience—“mostly the results you get are pictures of buildings, cars and technology. People are nowhere to be seen. Not a single image”. This type of imagined city is precisely the opposite of what a social city embraces: the idea of city as a self-regulated technological space is put aside in favor of a urban space that is sustained by human connections (and technology as a facilitator for such connections). As a result, the night began with strong words such as “compromise”, “engagement” and “ownership”: a city where citizens communicate with each other and with their government in a two-way, ideally transparent process. As the night unfolds it becomes clearer that a social city is as strong as the relationships that take place in it. The dynamics of the round of presentations reflected (not only from a content perspective but also in a performative manner) just how important and complex the ideals of communication and the socialization of ideas are. Ultimately, each group had a short amount of time to explain their project to the audience and to the corresponding stakeholder. This was followed by a response from the stakeholder stating his/her thoughts regarding the solutions proposed by the group and possibly a potential compromise to include in their agendas. Each project underwent the same process as the audience listened carefully and asked (if the time allowed it) a few questions. This was done with each “party” physically facing each other in a direct, face-to-face dialogue. In a week where statements such as “citizens need to communicate with their representative”, “citizens should have the means to affect their surroundings” and “collective participation” were common, the former exercise results were even more interesting. 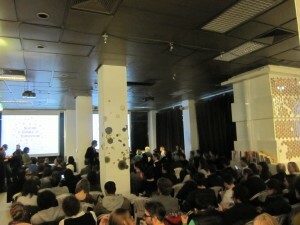 Little moments during the presentations brought a nervous laughter to all members present at the venue. For example, one the workshop presenters said (if I can remember the words correctly) that a specific crowd-sourced city project didn’t quite deliver what it promised and used that as example of why her project was taking a different approach. Only it just so happened that one of the persons in charge of the crowd sources platform in questions was sitting the first row. When this became known (I believe by the intervention of one the hosts) the presenter apologized, the audience laughed, the city hall representative gracefully smiled and the presentation went on – talking to City Hall in its most literal sense! Another example. Group one presented a plan that consisted on the short-term leasing of empty property in Amsterdam: a way to allow everyone to own (and develop) a piece of the city for the period of a year. Some of the comments from the audience were focused on “how will you get people to leave a space where they have invested so much during a year” or “they tried that somewhere else but money became a problem between people”. The laughter of the audience was now more of a nervous tittering. The project was seen as a solid plan; however, the citizen’s ability to make it happened was put in doubt. These small but meaningful moments during the presentations help understand that a social city will need to depend everyday more on solid traits of human character. A social city is definitely a positive way to head for, but nonetheless a way that still holds significant challenges for us in becoming (perhaps in a symbiotic process with our cities) more sociable citizens: a social city is as strong as the relationships that take place in it.